The Center For Grieving Children in Portland has helped more than 4,000 children, teens and adults work through their grief. 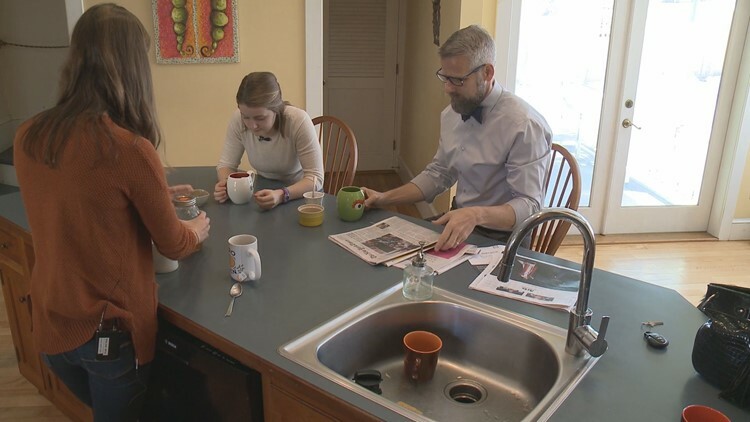 PORTLAND, Maine (NEWS CENTER Maine) -- The Center For Grieving Children has been helping families work through their grief for 31 years. When Jaxen and Scarlet Remme came to the center seven years ago, the volcano room was their favorite place to spend their time. A place to get out their frustrations because of their dad's choice to take his own life. "I remember graduation even in fifth grade was really hard for me because I'd see parents," said Jaxen. The 13-year-old wouldn't see her own dad. In the rooms of the Center for Grieving Children, the sisters would meet kids just like them with a feeling of loss. Talking through their grief with others their age was the best way to work through their sadness. "Gave me friends, like after my father died it was hard to relate with other kids," said 12-year-old Scarlet. The model of the center for grieving children has remained the same since it first opened in 1987, helping more than 4,000 grieving children and teens. Despite its name, a helping hand is also extended to families and adults. "People think of The Center for Grieving Children and therefore it's only children that we support. We support the whole family," said Anne Heros, executive director. "We support them when there's a death and we also support them when there's a life threatening illness,"
The help that is received is all volunteer based. Most of the volunteers found themselves at the center for the same reasons. Dr. Ed Tumavicus brought his daughters, Lucy and Grace, to help them mourn the loss of their mom Amy. Years later Ed is now the board president and his daughters are all grown up, but that doesn't mean they don't still find moments of grief. Dr. Ed Tumavicus with his daughters, Lucy and Grace. "To realize that Lucy is never going to know her mom the way I know her," said Dr. Tumavicus. "Part of my job is to pass that along to Lucy and to be the surrogate to her mom and say your mom would be super proud of you, I wish you were here." The center runs completely on donations, taking no state or federal aid. That's why their Midsummer Night's Soiree Benefit Concert Wednesday night at 6 PM at Vinegar Hill Music Theater in Arundel is so important. The benefit will feature music from the Don Campbell Band, food and conversation.